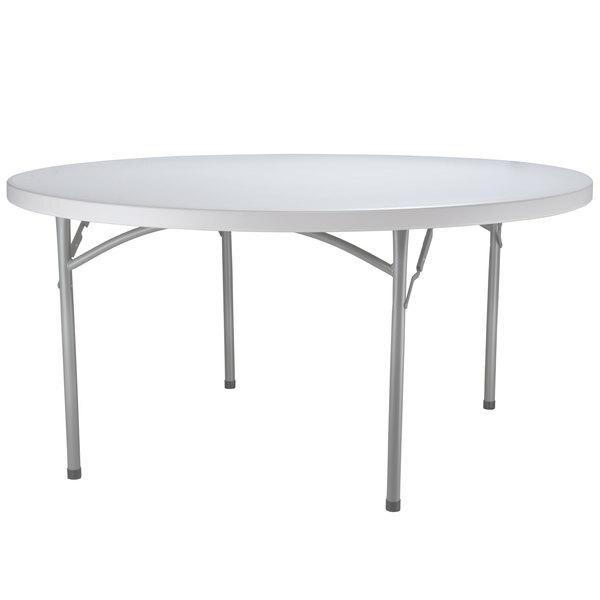 Perfect for both indoor and outdoor use, this 60 inch round folding table from Lancaster Table & Seating gives you the versatility you need at a price that can't be beat! Constructed of high impact polyethylene, this round white table will not crack, chip, or peel, and it is stronger, lighter, and more durable than wood. Ideal for dining rooms, kitchens, offices, conference rooms, restaurants, banquet halls, and all kinds of catered events, this 60" round table has a sturdy powder-coated steel frame with 19-gauge steel legs and a 1 3/4" thick granite-colored top, ensuring both durability and attractiveness. Add chairs to increase its versatility!